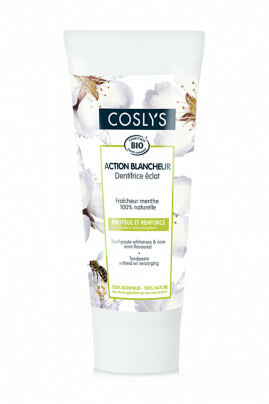 Coslys Organic Toothpaste with mint cleans and keeps your white teeth by reducing the buildup of plaque. Bicarbonate and silica strengthen the enamel, whereas organic propolis protects your teeth. Rich formula of minerals and trace elements, COSLYS Organic Tooth Paste Whiteness reduces the sensitivity of teeth and heals inflammations or irritations of gums. Keep your bright smile with COSLYS Organic Toothpaste Care & Whiteness ! Brush your teeth with Coslys Organic Toothpaste 3 times a day during 2 to 3 minutes. Coslys Organic Tooth Paste cleans and takes care of your natural white teeth ! Glycerin*, aqua, dicalciumphosphate dihydrate, titanium dioxyde , sodium bicarbonate, aroma, xanthan gum, cocamidopropyl betaine , alcohol* , propolis extract*, stevia rebaudiana extract, Sodium benzoate , linolool, limonene.